During my search a couple of weeks ago for copycat versions of my favorite drinks from Starbucks, I've shared with you a copycat version of their Salted Caramel Pumpkin Latte and last year was their Pumpkin Spiced Latte. 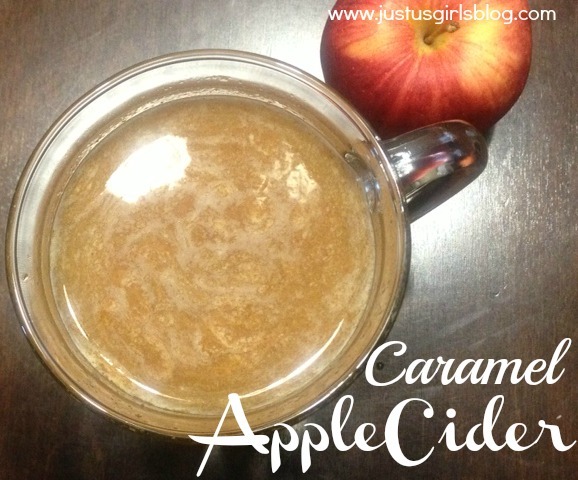 Now I bring you a quick and easy version of their Caramel Apple Cider. I remember last year going to Starbucks and buying a few of these and going back for more because they were so good and the kids absolutely loved them. As soon as it started getting cold my daughter asked for some warm apple cider. So when I found the recipe for a cheaper and easier way to make these bad boys at home, I had to try them. The kids came home from school and were so surprised and excited. I've never seen them finish any warm beverage before. Normally they get super excited about hot chocolate too, especially when I add marshmallows or whip cream, but they never seem to finish their first cup. These cups were emptied and they were asking for seconds. This recipe is definitely something that can be doubled or even tripled if you have more than four guests. This would be perfect for Thanksgiving, Christmas and New Years or just for sitting around the house on a cold day watching a movie or reading your favorite book. Enjoy! Directions: Using a crockpot mix in all of your ingredients and stir well. Place on low for about four hours and walk away, that's it! Once the four hours are done serve in mugs and enjoy. If you have left leftovers place in the refrigerator and you can serve it again the next day by filling up a mug and placing it in the microwave for a couple of minutes.